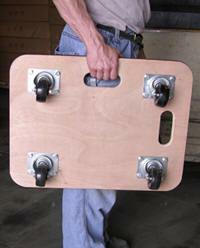 Fiberwood construction dollies feature a rubber padded surface and two hand holes to carry the unit (Pic. 2). The PVC edge strip protects walls from scrapes. Units roll on four swivel wheels which are non-marring and oil-resistant.